Jivan ma mukat thavu te bahu jaruri che pan te Gyani Purush vagar ane temani krupa vagar sakaya nathi mate te hajar hoyato kaam kaadhi sandho melavi levo. Pictures taken at Kenanpur Mandir celebration no November 30, 2010 are attached for your darshan. JSS Youth is excited to launch the first edition of our quarterly online newsletter JSS Times, available at http://newsletter.jssyouth.org/!!! We would first like to thank His Holiness Param Pujya Shree Kanudadaji for his divine grace and vision in making this project possible. 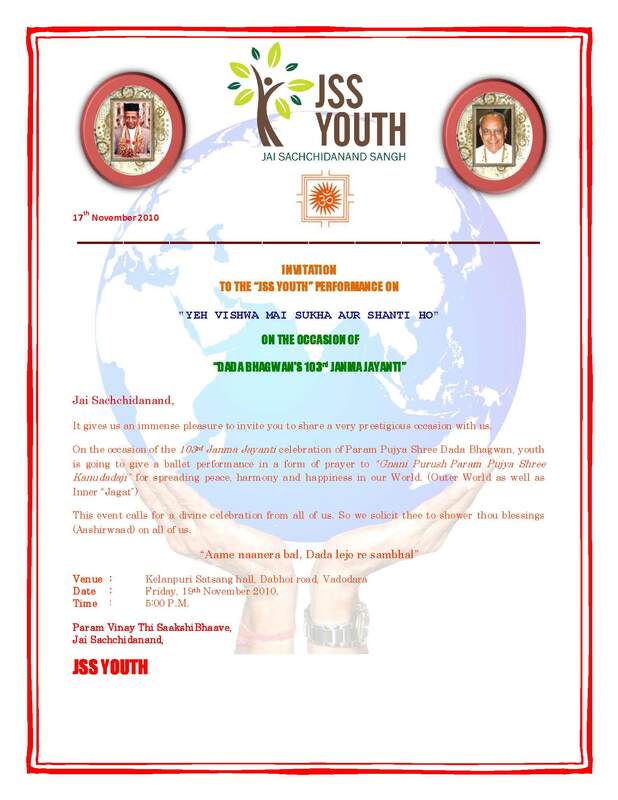 The Newsletter Team from JSSYouth has developed this newsletter to serve as a platform for sharing news, stories, information and educational opportunities with all JSSYouth and JSS Mahatmas worldwide. The name for our publication “JSS Times”, is not only fitting, but is also sentimental because it was proposed by our beloved Sakal Sanghpati Late Shree G. A. Shah Saheb. He saw to it that JSS Youth’s united platform becomes instrumental in the launch of a new information age through the development of this online newsletter. In a humble gesture to commemorate Shree Shah Saheb’s permanent presence in JSSYouth’s existence, on behalf of all JSS Youth worldwide, we dedicate this first issue in his loving memory. 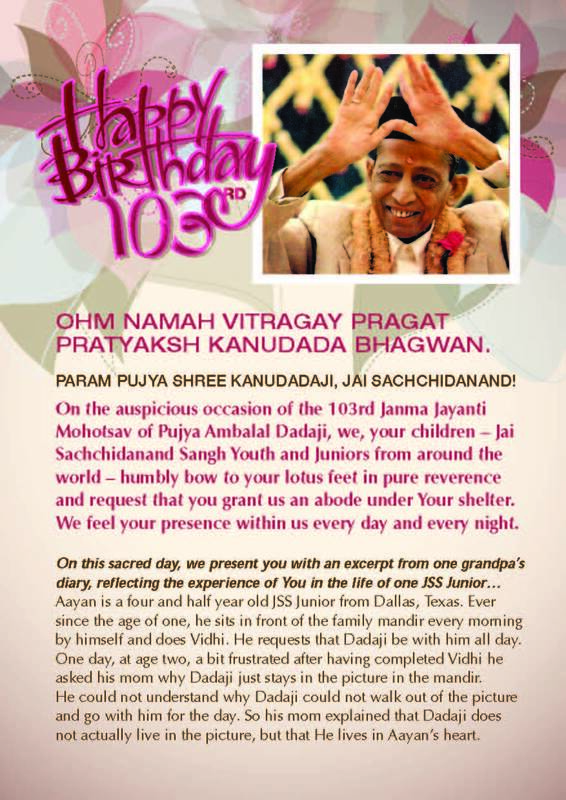 This edition features a diverse range of articles from a heartfelt tribute to our beloved Sakal Sanghpati the Late Shree G. A. Shah Saheb to sincere wishes on behalf of JSS Youth International for Param Pujya Shree Kanudadaji’s 81st birthday. We have also included a re-cap of the Holistic Science Charitable Research Foundation’s First International Conference on Holistic Vision and Integral Living. JSS Times will regularly feature essays from our members, as well as information on Gujarati classes for anyone interested in enrolling. 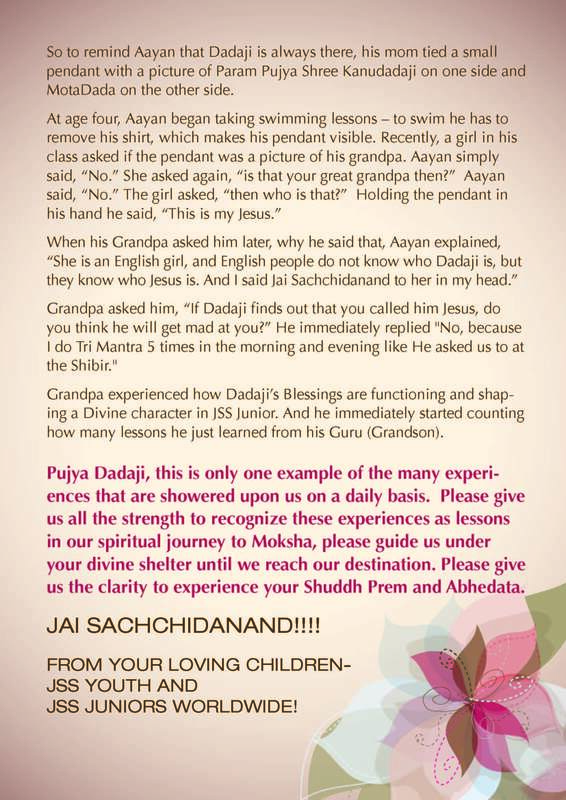 Jai Satchitanand and Happy Reading! You are caught in the cobweb of your own grip. Once you release the grip, you will find yourself free naturally. Please share your day-to-day experiences with us regarding this quote. How are we caught in the cobweb of our own grip? How do we free ourselves from this grip? If you haven’t already done so read about, Shri GA Shah Saheb and PPS Kanudadaji’s Blessings for him on the BLOG and email your experiences relating to Shri GA Shah Saheb to akramvignan! Please find pictures of PPS Kanudadaji taken on November 14, 2010. ‘True knowledge’ is the one which always enlightens you when needed. You will never forget what you have learned from observation and experience. Please share your day-to-day experiences with us regarding this quote. How has true knowledge enlightened you? What are the qualities of that ‘true knowledge’ which helps to enlighten you?